There are dozens upon dozens of eCommerce shopping carts for every store owner’s need. From super custom solutions to fully-hosted, we’ve already covered some of the most popular carts this past month. But there are a few that, though not as popular as Shopify or Magento, are still deserving of a mention as we wrap up our first annual shopping cart month. 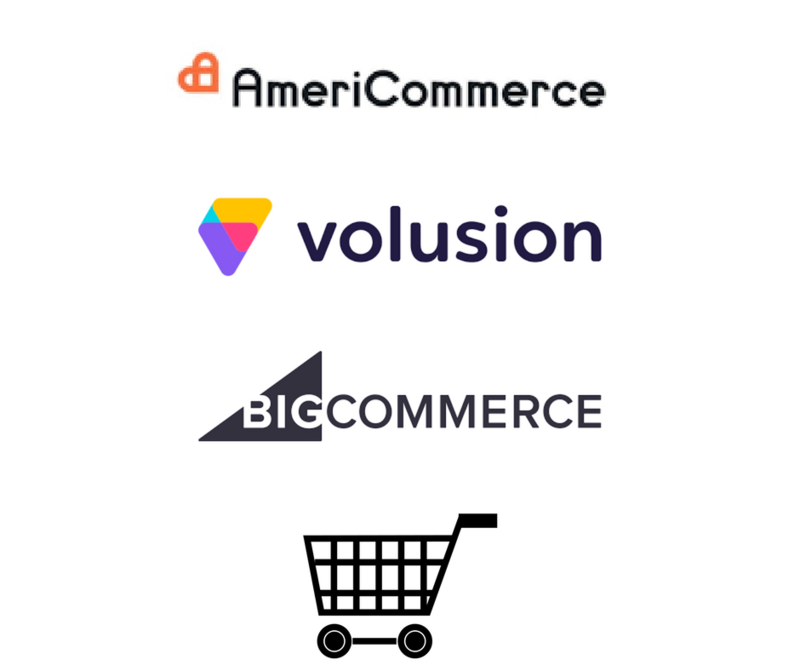 Today we take a look at Bigcommerce, Volusion, and Americommerce and compare and contrast their various strengths and weaknesses. Our special guest today is the founder and CEO of Americommerce, Ed Sturrock, who will weigh in on what’s to come for Americommerce and give us the background into their rather unorthodox story. Andrew: Welcome to the eCommerceFuel podcast, the show dedicated to helping high 6- and 7-figure entrepreneurs build amazing online companies and incredible lives. I’m your host and fellow eCommerce entrepreneur, Andrew Youderian. Hey, guys, Andrew here, and welcome to the eCommerceFuel podcast. Thanks for joining me on the show for what is sadly going to be wrapping up Shopping Cart Month. We spent the whole month so far talking about different shopping carts, the most popular ones at least in our community, Shopify, Magento, and WooCommerce. And I wanted to kind of use this last episode to chat about a handful of other carts that maybe aren’t, you know, the top three but are worthy of mention for one reason or another, either because they’re close, or because they’ve had big things happen, or they’ve just got interesting stories. So, that’s what I’m going to be doing today. Specifically, I’m going to want to talk to you guys about BigCommerce. BigCommerce is the number four most popular cart in the community and chat about kind of some of their strengths and weaknesses as I see them. I know some of the people’s experiences in the forum with them over the last couple years. Let’s talk about Volusion, the fifth most popular cart in the community and kind of where they’re at in the cart life cycle, and people’s thoughts on them. And then we’ll also talk about AmeriCommerce, who is not necessarily the sixth most popular. It’s one that just interested me for reasons I’ll get into kind of when we start chatting about them. It seemed like an interesting cart. They kind of have a cool, unorthodox story, I will say. So it’ll be fun to geek out and kind of finish and wrap things up with a grab bag of carts. But before jumping into that, I do want to thank quickly our sponsors for the show. First Klaviyo who makes email automation easy and powerful, and their killer feature, if you don’t know by now, is the ability to create insanely targeted email flows that go out to your customers. And the cool part about this is you can create these flows based on so many criteria, but one example is you can create a flow that goes out automatically to customers who are VIPs. Maybe, for example, you want to set it up where customers who place more than three orders for more than $500 worth of stuff in a 6-month period get a customized email from you. And that could be anything from just a fun email that will show your appreciation. Maybe you include a VIP phone number or your cellphone number for personalized service, maybe a coupon, maybe a fun video with your whole team, you know, cheering and showing their appreciation. You could get really creative with this kind of stuff. That’s just one example, but one of the things you can do with Klaviyo. So if you’re not using them, you’re almost certainly leaving money on the table. Check them with a free trial at klaviyo.com. And secondly, I want to thank the team over at Liquid Web, who offers managed hosting for WooCommerce. And just like you’d expect, the offering is built from the ground up for WooCommerce to provide an elastic, highly-optimized platform for your store to run really well. But one thing I want to mention today is just their reputation. I, you know, I met the team there at a conference this last summer and was impressed with them. I met with the guy who’s heading up their WooCommerce offering. His name is Chris Lema. That name’s going to ring a bell if you’re in the WordPress or the WooCommerce space. Great team. Asked around with my WordPress connections and they’ve got a great reputation in this space, and even in eCommerceFuel, Liquid Web in general has a 4.7/5-star rating in our private review directory. So, it’s a good company. It’s a solid company. So if you’re on WooCommerce and you want a rock-solid platform for your store, check them out. And you can learn more about them at eCommerceFuel.com/LiquidWeb. So let’s start off talking about BigCommerce today. So, the number four cart in our community, again, we’ve got some software that tracks all of our 1,000-members tech stacks for their carts and BigCommerce is number four on the list. So they use, I think about 57 people as of the beginning of 2018, are using BigCommerce. They are reviewed, you know, everyone can rank their shopping carts, you know, out of 5 stars and they get a 3.3/5. I think for comparison’s sake, Shopify is a 4.7, WooCommerce is a 4.3, and I think Magenta is a 3.7 or 3.8. So, historically I would say they have had a more complex feature set out of the box than Shopify, especially if you’re looking for, you know, if you have a lot of products, a ton of products, or you have products that have pretty sophisticated or complex kind of customization needs. Maybe you’ve got seven or eight things people need to optimize on a product. BigCommerce has traditionally been pretty, you know, pretty strong in that regard. Probably the most notable thing about BigCommerce, I would say, is about 18-24 months ago they rolled out some big, fairly large pricing increases that I think did not, really didn’t sit well with, at least I’ll speak for our community, with members who are on the platform, and it seemed to be done pretty quickly and to be frank, they made people pretty angry, about 18-24 months ago. But that was, you know… And I’ll link up to the discussion on that so if you’re a private community member you can check out what transpired there. And I talked with them at IRCE, talked to part of their team, and kind of shared some those concerns with them, and had a chance to chat with some of their leadership to, you know, just kind of let them know what, from my perspective and our community’s perspective, what happened. And they, you know, to their credit they were very open to listening. They acknowledged some of those issues, you know, in terms of the pricing. Not so much that, I think on their end they said that, you know, the pricing really more or less was in a lot of ways in line with other offerings on the market, but maybe acknowledged that it could have been rolled out a little bit better. And they are doing some things. It sounds like they’re doing stuff like bringing customer support back to the United States. Customer support had been a complaint from people. And they said they were working on some other things and really trying to make up for some of those, you know, real or perceived mistakes, at least from their perspective, from the last 18 months. So, you know, I asked also, I haven’t used BigCommerce. I don’t have as much experience with it as I have the other three carts we talked about in Shopping Cart Month so far. But, you know, asking people in the community if they had improved over the last 18 months, I definitely got kind of responses on both sides. I’d say, you know, about a third of the responses were people who were still feeling burned from kind of the fallout from the pricing increase from 18 months ago. Some people, you know, probably a little less than a third, mentioned technical issues that they still saw. And there was still probably about, you know, probably a little more than a third, probably about 35-40% of people who were still happy and satisfied with their BigCommerce store. So it’s, you know, just candidly that’s kind of what I’ve seen with BigCommerce over the last couple years. I think, you know, their big advantage is, like I mentioned, catalogs with complex products are great. On Shopify, Shopify does a lot of things well. If you have a ton of products on Shopify, you kind of have to create these navigation bars and menus. Kind of it’s really use of their tag structure which, you can get the job done but it’s not exactly, it’s not built for that. So catalogs with complex products are good, and lots of attributes. And they also have the ability to control the checkout page pretty well, which is nice. Disadvantages historically, you know, support has been okay only, although they are trying to improve that, I think bringing support back to the States domestically. And their stencil template engine is probably not quite as robust as the Liquid Web template engine you’ll find on Shopify. Anyway, those were my thoughts on BigCommerce. Hopefully it kind of informs maybe some of your thoughts if you’re thinking about moving there, concerning them. I want to move on to Volusion. So, Volusion, to give you a little context, is the fifth most popular cart, currently used by about 21 people out our 1,000 members, so really only about 20%, and they have an average review of, you know, star rating of 2.5/5 stars, which is going to be the lowest out of all five of those carts. And, you know, Volusion is interesting, and again, this is stuff that kind of… It’s funny my role, especially after selling my store, it’s kind of morphed into a little bit of trying to be the eyes and ears of this community and taking a lot of data points from different places. And I’d say if I had to summarize, just from a lot of different data points I’ve heard, Volusion is probably a company that’s been languishing for a little while. Not an awful company by any means, but just dated, I would have to say. Reading through some of the reviews and talking to people, you know, I just heard words like “antiquated,” “late to roll out technology,” phrases like “very little has been done in the last few years,” “clunky UI,” came up quite a bit. And so I, you know, I’d say between the star rating our community gives it and also just some of those anecdotal experiences I’ve heard from people, it probably would not be a platform that I would recommend going to at this point, you know, in 2018. So maybe that’ll change in the future but that’s just what I’ve seen. So finally I want to talk about AmeriCommerce, and AmeriCommerce isn’t really, you know, one of the more popular carts. It’s really only probably used by 1% of our community. I think we have about 9 installs in our community base using it. So why am I, you know, talking about them? The reason is because when they came on the scene back in 2013 or 2014, at least when I started noticing them, there were a couple things I liked. One, they seemed really merchant-focused. It seemed like they had a cool culture that kind of was reminiscent of the Shopify startup culture, which I had been impressed and still am impressed by, and they had a pretty rich feature set and seemed like they were innovating at a fairly quick rate. And then they got bought out by Capital One, of course the enormous financial credit card company in the United States. And since then they really, it seemed like that acquisition was, as you might expect being bought by an enormous corporate behemoth, probably was not the best thing for innovation. And so that bummed a lot of people out, myself included. Well, the news broke, I don’t know, the last, you know, couple months, that AmeriCommerce actually did a buyout from Capital One to go independent once again. The founder, the guy who originally started it, you know, raised some money and bought the company back from Capital One. And I thought that, (a) that’s fairly unusual. You don’t see that happen often. And (b) given that they seemed to have a lot of promise early on, I thought it would be interesting to chat with him. And so, Ed Sturrock is the founder and CEO of AmeriCommerce, and go ahead and just jump right into my discussion with him. Andrew: Ed, so back in, oh, probably maybe 2013-ish or so, AmeriCommerce really came on, at least my radar, a lot of people’s radar in the community. You guys were really, and still are, but noticed you out of the gates were the kind of a unique company in terms of you had kind of a fun interesting culture. You seemed very focused on functionality, very merchant-focused, and then you had, of course, in 2014, the sale to, I think, Capital One. So, can you give me a sense of why you sold? I mean, obviously anytime you get, you know, you build a company and someone acquires it, it’s a hard thing to turn down. But what went into the decision? Why did you guys decide to sell? It seemed like you had a lot of momentum at that time. Ed: Yeah, that’s a great question. So, when we look back to 2013 or 2014, it was such an exciting time in our company, you know. We were really starting to get off the ground, well-known in the communities that are out there, and we were doing really great with our product. And it brought a lot of attention across the industry, you know, from some pretty big players. What we were looking for at that time, we were looking for scale, you know. We were looking for somebody that had an embedded merchant base, right, that worked with small businesses day-in, day-out, knew them. And what we wanted to do was we wanted to align with somebody with a native community like that and be able to integrate our platform in with that. Enter at that time, Capital One, you know. And Capital One had a cool product that was kind of like a Square competitor, an up and coming Square competitor who looked very compelling from the outside, and they had, you know, millions of small businesses as part of their banking ecosystem. You know, I think that for me, trying to grow the company and trying to learn our way into, like, who is the right merchant base for us at the time. You know, were we entry level, were we mid-market, were we enterprise, you know? We had kind of centered on mid-market, but we were steadily skewing more and more down-market. And so we really looked at that as a great opportunity to expand the merchant base and see what we could do with some deeper pockets, what we could do to bring our culture into, you know, a banking culture that was trying to innovate at the time. Andrew: And you went, you know, just this last year, which is one of the reasons we’re talking now, you decided to go, kind of go back independent, buy the company back from Capital One, a pretty unusual move. It obviously caught my attention and a lot of other people’s attention. How much of that was based on culture? Because, I mean, it seems like you guys’ culture, from the little I know about it, versus the culture of a place like Capital One, a huge institution, it seemed like potentially there could be some problems with integrating those two. How much of that, if at all, was driving the decision to go independent? And why did you guys go ultimately back to being independently owned? Ed: Yeah, culture is such a driving force for us as a company. We are, by nature our DNA, we are feature junkies. We love innovation. We don’t like road blocks. We want to keep moving fast. We want to build. That’s what we all do. I personally, I’m the CEO but I come from a software development background, you know. Like I love developing this product. I love our merchants. And with a company of 44,000 people, there was a lot of learning that we had to do to innovate within that culture. We did innovate within that culture but it was under some various strategies, you know, that Capital One needed to execute on. And, you know, for me if I’m looking back, now that I can see clearly backwards, those strategies weren’t necessarily centered on our mid-market merchant, you know. So if I’m a merchant which, you know, a lot of my friends and family and a lot of good people that I’ve come to know over the years as merchants, you know, they were no longer the center of focus. It was a more broad, small business focus, right? And so you kind of lose that focus and then it started feeling to me as a builder, as an innovator, and to our culture, that we’re starting to slow down, you know. So what are we going to do about that, you know? That’s what we asked ourselves. What are we going to do about that? Do we fit in the broader strategy that Capital One is trying to accomplish? Is it centered on our merchants, not just any merchant but our merchants? And I think that the ultimate answer to that was there was an opportunity for improvement, you know, and how can we do that? And the best way to do that was to go back independent. It is an unusual choice, right? You know, you go into a large company like that. This is a very unique situation. Most of the time these things either fade away, you know, or they completely pivot and go in a different direction. And for us, what we wanted to do was focus, but we actually wanted to bring it back home and focus intensely on who we are and who we’re building towards, which I think is the right answer for any product no matter what the industry is. And so that was really the driving factor. Andrew: One of the things that you guys seemed to right out of the gates do really well, and you mentioned, and I’ve heard it from other people, was a focus on features. Once you got purchased, you kind of alluded to it and I’ve heard this from other people as well, over the last couple of years under Capital One it’s been difficult, probably to innovate at the level you wanted to. And I know merchants have kind of said they haven’t seen a whole lot of innovation since then, but that’s in your DNA. So what kind of stuff, now that you’re independent and kind of have a little more, much more flexibility, what are you really focused on building out in the next year? Like maybe you can give me some examples either areas you’re focused on or even better maybe some specific features you guys are going to try to build out over the next 12 months. Ed: Yeah, for us what we want to do right now is focus on those routines, optimize them, put some more power and flexibility in to compete with the Amazons of the world. You know, we kind of liken ourselves to like the PhotoShop of ecommerce, you know. We are trying to have the power and the control that you need to run really unique campaigns. You know, if you need to price by the foot or buy quantity at various levels for just certain merchant types on Sunday, the weekend, you know, during the weekend, for just Nike products for instance. You know, like these are things that you can accomplish with our platform. It’s a lot about the optimizations, adding more features and more power to the platform that our merchants are needing from us. We take a look at things, you know, every two months and we let our merchants kind of tell us what they would like us to build. A lot of times that is things that enhance the features that we already have, producing some new payment gateway integrations that are needed. We are looking at optimizing the work flow as you process an order, and the checkout experience for instance. And we are looking at a few more integrations that are pretty interesting to us, and we are looking at launching some new features that are kind of merging the buyer, the seller, and kind of what we call experts. More to come on that. That is something that we’re pretty excited about, but I can’t go into too much detail on that. But it should be a very good way to move the needle for a lot of our merchants, trying to marry who their experts are in their community with their consumers and as the merchant they will benefit from that feature as well. Andrew: Very cool. We had a discussion on the forums about AmeriCommerce, about you guys going independent again, and chatting with a handful of existing clients, a couple of things they were hoping, they’d love some, just to kind of hear from you on, and one of them was that you touched on was overhauling and improving the checkout experience, you guys’ one-page checkout. A lot of, at least two or three people on that thread had mentioned that was something they’d love to see updated. Can you give a little more detail into what you guys are changing and what functionality you’re adding to the checkout process? Ed: Yeah, sure. You know, the checkout process for us is about speed and flexibility. So one of the things that we’re looking at as we overhaul it is, how can you go through that flow with as minimal a number of steps but still contain the flexibility that some of our power merchants need to be able to customize the checkout flow for them and their needs. And so what we have is, we have in QA right now a revamped version of our checkout flow, which is arguably the most important flow in the system. So we’re taking our time, we’re doing it right. But it is something that we look forward to adding. The main goal there, again, is speed, reduced complexity, and improved flexibility. Andrew: So, speed’s pretty, you know, obvious. It just goes faster. In terms of improved flexibility, what is an example of something somebody could do on the new checkout that they weren’t able to do before? Ed: Some things that you can do is have multiple payment methods, gift certificates, coupon codes, kind of all at the same time, and having additional layout control than what our theme system already provides, which is already fairly flexible today. Going into some of the various widgets and keeping them, keeping the layout control very smooth inside of those widgets, is a priority for us as well. Andrew: Another popular question people had in the forums was, “Wondering if you guys were going to potentially change your pricing model, to move away from charging for bandwidth?” That was something that people were really interested in. Is that something that’s on the table, or are you guys going to stick with that in the future? Ed: Right now the current plans are to continue with the approach but add and change some of the limits that are out there, and marry it with some product launches that are coming very soon in order to produce more value for our merchants. We are in a, like for me personally, I want to be out of that revenue stream. I want to be completely and fundamentally aligned with our merchants’ success in revenue. And with that, though, comes a different way to price their product, right? And so the people that may not like bandwidth may not want to have, you know, transaction fees, or they may not want to have order fees like some of our other competitors do. And so what we’re trying to do is kind of balance that, split the difference in the meantime and see what our merchants need from us in a way that aligns our success with theirs. So, pricing models changing next year, but in a way that reduces pricing for most of our customers and should be pretty interesting. Andrew: Can you talk any more about how you’re going to set that up, or have you guys decided on that? Ed: We’re learning our way through it right now. We launched a few test campaigns and have the additional features that are coming that will kind of be married to this strategy, so we’re well underway. Andrew: Well, one thing I’d love to get your take on is, is the ecosystem around your cart, and it’s such an important part about how people pick a cart. I went, you know, when I migrated recently looking at different cart’s ecosystems in terms of apps and developers it was a pretty big consideration. And you can kind of take two approaches. You can take kind of the third-party approach, specifically I mean app-side, you know, for example like Shopify. This has been something they have focused on, really trying to trying to cultivate a large ecosystem. They built out a really core product and probably less feature-rich than let’s say some other offerings on the market, but with a lot of emphasis on making it really easy to integrate and really trying to support that third-party community and developers. The other approach, I mean, that’s powerful and it takes a long time, and it’s, you know, it can be, it’s a big endeavor. The other side, of course, is potentially the flip side of the coin is to develop more internal features, focus less on a third-party system, but really try to build those things out as part of the core offering, but of course that takes more internal resources. So, for you guys to come and kind of really going independent and, you know, building up momentum again, what’s your thought process about that? How are you guys planning on trying to build out a robust either third-party system or really, you know, really strong internal features? Are you guys going one or two of those routes, or what are your thought processes there? Ed: That’s a good question. You know, we focus on rule engines and power inside of our product, to be able to have a lot of additional flexibility. We also build our product on top of our own RESTful API, and so with that RESTful API is a public API that integrators can use, merchants can use, and so we also continue to add integrations to our app portfolio. And so it’s a little bit of both, you know, a little bit of internal engineering, a little bit of partner engineering, and a little bit of community applications that integrate with us. One of our approaches, you know, in going through that is because we have the powerful product, you know, a lot of integrations that are out there, not intending to cast stones in any way, but a lot of the integrations are very shallow integrations. You know, they, like maybe they will update the price but they won’t work with your pricing model at the inner depths of the product. And so because of that, you know, our integrations a lot of times they may go a little bit deeper, and we believe then in empowering the use cases that are more than just the logo in the app store, if that makes sense. Andrew: Let’s do a kind of last wrap-up question here, Ed, but I think it’s an important one. You know, obviously you guys are a hosted solution and if someone’s thinking about migrating to a new cart on the hosted side, kind of a 500-pound gorilla in the space is Shopify at the moment, what would you say to someone like, who is, if someone was going to pick you guys over Shopify in 2018 for their next cart, what do you think the most compelling reason that they should do that is? Or maybe stated in a different way, who can you serve in a more effective and better way than Shopify could? Who is the perfect merchant for you, that maybe you’d be better fitted to than Shopify? Ed: Our merchants choose us because they are able to morph the platform around their business instead of morphing the business around their platform. The power inside the platform is not something that you would get at a Shopify. You know, Shopify is a broad-stroke approach to ecommerce and then they augment via partners. But by the time you add, you know, the seven partners that you need to produce a successful organization, you’ve, you know, quintupled or 10X your spend for something that you could potentially get with a core ecommerce system that kind of focused on the use cases that you needed. Plus you get all of that stuff kind of working together and it’s on us to make sure that that keeps working, as opposed to trying to do the partner shuffle and, you know, the finger-pointing of, “Well, it’s their problem,” or “It’s this person’s problem.” We take point on that. You can also manage multiple storefronts with our platform. That’s something that Shopify and very few others are able to do. You can actually have one catalog across 20, 30, 40, 100 different stores, or you can actually have a unique catalog for each store and share just a few products in between them. You can do multi-vendor stuff. You can do marketplace things. And you can take your catalog and put it on your WordPress store, or your Facebook, your Twitter, and actually do your remote embedded commerce out across other existing properties as well. Not just a “buy” button, right, but an actual way to view and interact with your product catalog on remote websites, which is something that a lot of people aren’t really doing. So those are a lot of good reasons for us. Andrew: Well, Ed, it was really cool to see you guys go independent this year. Looking forward to watching what you guys do in 2018, and thanks for taking the time to talk. Ed: Yeah, same here. Good luck with eCommerceFuel. It’s one of the most respected communities out there. We love it and point people to it all the time. So, good job with your community in there. Andrew: Well, thank you. Appreciate the referral, sir. That’s going to do it for this week’s episode, but if you enjoyed what you heard, check us out at eCommerceFuel.com where you’ll find the private vetted community for online store owners. And what makes us different from other online communities or forums is that we heavily vet everyone who joins, to make sure that they have meaningful experience to contribute to the broader conversation. Everyone who we accept has to be doing at least a quarter million dollars in annual sales on their store, and our average member does seven figures plus in sales by their business. 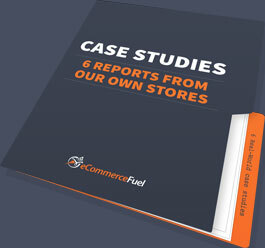 And so if that sounds interesting to you, if you want to get, you know, connected with a group of experienced store owners online, check us out at eCommerceFuel.com where you can learn more about membership, as well as apply. And I have to, again, thank our sponsors who helped make this show possible. Klaviyo who makes email segmentation easy and powerful. The cool thing about Klaviyo is they pull your entire catalog customer and sales history to help you build out incredibly powerful automated segments that make you money on autopilot. If you’re not using them, check them out and try them for free at Klaviyo.com. And finally, Liquid Web, if you’re on WooCommerce, if you’re thinking about getting on WooCommerce, Liquid Web is the absolute best hosting platform for three reasons: One, it’s built from the ground up for WooCommerce and optimized by some of the best industry professionals in the WooCommerce and WordPress space. They really know the stuff. And it’s highly elastic and scalable, as well as comes with a whole suite of tools and performance tests to optimize your store. You can check them out and learn more about their hosted WooCommerce offering at eCommerceFuel.com/LiquidWeb. Thanks so much for listening. Really appreciate you tuning in. Looking forward to talking to you again next Friday. Want to connect with and learn from other proven ecommerce entrepreneurs? Join us in the eCommerceFuel private community. It’s our tight-knit vetted group for store owners with at least a quarter million dollars in annual sales. You can learn more and apply for membership at eCommerceFuel.com. Thanks so much for listening, and I’m looking forward to seeing you again next time. Velocityship has been performing out and ships quite quickly – super quick to respond to questions and offer advice….